When first discovered by Europeans, Pennsylvania was inhabited by groups of Native Americans. The life of the Indians reflected Stone Age backgrounds, especially in material arts and crafts. Tools, weapons, and household equipment were made from stone, wood, and bark. Transportation was on foot or by canoe. Houses were made of bark, clothing from the skins of animals. In the mid-1700s, both Britain and France were eager to take control of western Pennsylvania, a region of strategic importance and vast economic potential. In this modern painting, artist Robert Griffin depicts a scene recounted in the diary of French Jesuit priest Joseph-Pierre de Bonnecamps, who in the summer of 1749 dined in a hollow cottonwood tree, “in which 29 men could be ranged side by side,” near the site of present-day Pittsburgh. The rudiments of a more complex civilization were at hand in the arts of weaving, pottery, and agriculture, although hunting and food gathering prevailed. Some Indians formed confederacies such as the League of the Five Nations, which was made up of certain New York-Pennsylvania groups of Iroquoian speech. The other large linguistic group in Pennsylvania was the Algonquian, represented by the Delaware, the Shawnee, and other tribes. To encourage the settlement of his territory, William Penn issued an invitation to prospective settlers, offering them one thousand acres of land for twenty pounds, or at an annual rent of one penny per acre. Many people, chiefly Quakers, were induced to purchase, and in the fall of 1681, three ships full of settlers sailed for Pennsylvania. William Penn and his fellow Quakers heavily imprinted their religious values on the Pennsylvania government. Among the most radical belief was religious freedom for everyone, as well as fair dealings with Native Americans. This extreme tolerance led to significantly healthier relationships with the local Native tribes. In 1737, the colonial administrators claimed that they had a deed dating to the 1680s, in which the Lenape-Delaware had promised to sell a very large portion of land beginning between the junction of the Delaware and Lehigh Rivers and “as far west as a man could walk in a day and a half.” This purchase has become known as the Walking Purchase. Chief Lapowinsa was a Delaware Indian chief who signed the Walking Purchase Treaty of 1737 in Philadelphia. This treaty granted to the whites land extending from Neshaming Creek as far as a man could walk in a day and a half. When the survey was made under this stipulation, the governor of Pennsylvania had a road built inland and employed a trained runner, a proceeding that the Delawares denounced as a fraud. Although the document was most likely a forgery, the Lenape didn’t realize that. Provincial Secretary James Logan set in motion a plan that would grab as much land as they could possibly get, and hired the three fastest runners in the colony to run out the purchase on a trail that had been cleared by other members of the colony. The pace was so intense that only one runner actually completed the walk, covering an astonishing 70 miles. This netted the Penns 1,200,000 acres of land in what is now northeastern Pennsylvania, an area roughly equivalent to the size of the state of Rhode Island. The Lenape tribe fought for the next 19 years to have the treaty annulled, but to no avail. The Lenape-Delaware were forced into the Shamokin and Wyoming Valleys, which were already overcrowded with other displaced tribes. The Lenni-Lenape, or just Lenape, were organized bands of Native American peoples with shared cultural and linguistic characteristics, who were the inhabitants of Delaware, New Jersey, Eastern Pennsylvania, and Southern New York in the seventeenth century. They were called Delaware Indians only by the European colonists. Their Algonquian language is known as either Lenape or Delaware. The Lenape practiced large-scale agriculture to augment their mobile hunter-gatherer society. They were largely a sedentary people who occupied campsites seasonally, resulting in relatively easy access to the small game that inhabited the region: fish, birds, shellfish, and deer. They developed sophisticated techniques of hunting and managing their resources. By the arrival of Europeans, the Lenape were cultivating fields of vegetation through the slash and burn technique, which extended the productive life of planted fields. The two key components of slash and burn agriculture are the use of fire to prepare fields for cultivation, and the subsequent abandonment of those fields as productivity declines, due to the depletion of soil nutrients and the invasion of weeds and pests. Once abandoned, the fields were allowed to return to a more natural state as native plant and tree species reclaim them. According to Dutch settler Isaac de Rasieres, who observed the Lenape in 1628, the Lenape’s primary crop was maize, which they planted in March after breaking up the soil. European metal tools were adopted quickly for this task. In May, the Lenape planted kidney beans between the maize plants that later served as props for the climbing vines. The summers were devoted to field work, and the crops were harvested in August. Families were important to the Lenape Indians. There were strong ties between parents and children, and among all the related families that made up the clan. The Lenape had three clans – wolf, turtle and turkey – who traced their descent through the female line. Women were responsible for the planting and harvesting of crops and gathering of wild foods, and for preparing meals and caring for the children. They were skilled at making clay pots and baskets, and at weaving rush mats and bags. They wove cornhusks for slippers, mats, and dolls, and made containers from elm and birch bark. With fibers from the inside of plants, they spun and braided cords for binding and carrying bundles. Women were also responsible for preparing the hides for clothing and shelters. With bone tools, they scraped the hair from the hides and cleaned them, then smoked the hides, cut them into pieces, and sewed the pieces together with bone needles. These were a powerful Iroquoian-speaking tribe who lived along the Susquehanna River and its branches from the north end of Chesapeake Bay in Maryland, across Pennsylvania, and into southern New York. 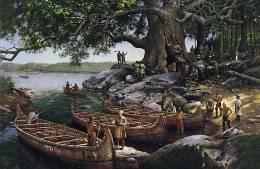 The Susquehannock were one of the most formidable tribes of the mid-Atlantic region at the time of European contact. Little is known about them, since they lived some distance inland from the coast, and Europeans did not often visit their villages before they had been destroyed by epidemic and wars with the Iroquois in 1675. The best guess of their population is somewhere between 5000 to 7000 in 1600, in at least five tribal groups. By 1700, there were only 300 Susquehannock. Their rapid decline continued until the last 20 were massacred by a mob of colonists in 1763. There are, however, known descendants among the Iroquois and Delaware. The famous Oneida sachem during the American Revolution, Skenandoa, was of Susquehannock descent as was Logan, a Mingo chief in Ohio. The constant warfare between Iroquian-speaking tribes gave the Susquehannock a military advantage over their more peaceful Algonquian neighbors to the east and south. Using canoes for transport, their war parties routinely attacked the tribes along the Delaware River, and traveled down the Susquehanna where they terrorized the Nanticoke, Conoy, and Powhatan living on Chesapeake Bay. Like other Iroquian tribes, the Susquehannock farmed extensively. In the spring, they planted maize, beans, and squash in the fields near their villages. After this was finished, many groups moved south for the summer to temporary sites on Chesapeake Bay to fish and gather shellfish returning in the fall to harvest their crops and hunt. Although they inflicted a major defeat on the Mohawk shortly before 1600, wars with the Iroquois had by 1570 forced the Susquehannock south into the lower Susquehanna Valley. Hardened by years of constant warfare, they overwhelmed the Algonquian tribes along the shores of Chesapeake Bay and began extending their control southward. The first European contact with the Susquehannock was in 1608 when Captain John Smith from the Jamestown Colony was exploring the northern end of Chesapeake Bay. He was especially impressed by their size, deep voices, and the variety of their weapons. Their height must have been exceptional, because the Swedes also commented on it thirty years later. The Powhatan also knew the Susquehannock (whom they called cannibals) from painful experience, and when the English first settled Virginia, the Powhatan had placed their villages well inland to protect them from Susquehannock war parties who ranged the coastline by canoes. One reason the Powhatan were not completely opposed to English settlement at first was that they provided additional protection, but the Susquehannock still attacked the Powhatan villages in northern Virginia. The English in Virginia soon grew interested in fur trade with the Susquehannock, and William Claiborne established a trading post on Kent Island in upper Chesapeake Bay in 1631. The Susquehannock by this time were able to trade with the French in Canada, the Dutch on Delaware Bay, and the English in Virginia. The friendly trade relationship with the English became increasingly strained after the settlement of Maryland by English Catholics began in 1634. The desire to trade kept the English and Susquehannock from open warfare for a while, but steady encroachment eventually led to a series of incidents and confrontations. Hard pressed by the Mohawk, the Susquehannock tried to strengthen their ties to the Dutch in 1651, by selling them some land on the Delaware River, but the Dutch remained neutral. The Swedes continued to supply them with anything they wanted, but the Susquehannock had become involved in fighting with Virginia Puritans who had settled in northern Maryland in 1649. Not able to fight two wars at once, they in 1652 signed a treaty with Maryland ceding much of the lower Susquehanna Valley to secure peace and trade with the English. Smallpox hit their villages during 1654, but this affected the Mohawk as much as the Susquehannock and slowed the fighting. A major blow came in September 1655 when the Dutch seized the Swedish colonies – the Susquehannock’s primary supplier of furs, and they were forced to ask the Mohawk for peace, they agreed in 1656. The worst blow, however, was a smallpox epidemic in 1661 that devastated their population to a point from which it never recovered. Still they managed to hold on. 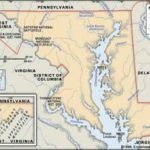 A treaty signed with Maryland ended the lingering hostility with the English. In the end, the Susquehannock fell victim to new diseases brought by European settlers, and to attacks by Marylanders and by the Iroquois, which destroyed them as a nation by 1675. A few descendants were among the Conestoga Indians who were massacred in 1763 in Lancaster County. The Shawnee were an important Algonquian-speaking tribe, who originally lived in southern Ohio, West Virginia, and western Pennsylvania. 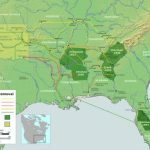 They were driven from their homes by the Iroquois during the 1660s, and then scattered in all directions to the Carolinas, Tennessee, eastern Pennsylvania, and southern Illinois. They came to Pennsylvania in the 1690s, some groups settling on the lower Susquehanna, and others with the Munsee near Easton. In the course of time, they moved to the Wyoming Valley and the Ohio Valley, where they joined other Shawnee who had gone there directly. Just before the mid-1700s, they managed to return to their homelands only to be driven out again – this time by the Europeans who were bent on settling this land and claiming it as their own. Moving first to Missouri and then to Kansas, the main body finally settled in Oklahoma after the Civil War. The Shawnee were allies of the French in the French and Indian War, and of the British in the Revolution, being almost constantly at war with settlers for forty years preceding the Treaty of Greenville in 1795. After Wayne’s victory at Fallen Timbers (1794), they settled near the Delaware in Indiana, and their descendants now live in Oklahoma. Shawnee children grew up as free as the animals that roamed the forests around them. Young boys were encouraged by elders to engage in sports of running, swimming and jumping in order to strengthen muscles and build stamina, and to practice archery to develop their skills as hunters and warriors… The young girls busied themselves imitating their mothers, making mud pies, and particularly developing their skills in molding vessels of clay. Shawnee men were hunters and warriors. The women of the tribe did the domestic labor. 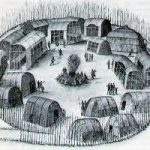 They built the lodges, dressed the game, cooked, planted and cultivated the gardens, scraped and tanned hides, made clothing and blankets, wove baskets and made vessels of clay. The women also cared for the ailments within a tribe, and were extremely skillful at mixing herbs and setting fractured bones. Well known leaders in the Shawnee Nation were Tecumseh and his brother Tenskwatawa (The Prophet), Cornstalk, Blackfish, Black Hoof, and Bluejacket. So live your life that the fear of death can never enter your heart. Trouble no one about their religion, respect others in their view, and demand that they respect yours. Love your life, perfect your life, beautify all things in your life. Seek to make your life long and its purpose in the service of your people. Prepare a noble death song for the day when you go over the great divide. Always give a word or a sign of salute when meeting or passing a friend, even a stranger, when in a lonely place. Show respect to all people and grovel to none. When you arise in the morning give thanks for the food and for the joy of living. If you see no reason for giving thanks, the fault lies only in yourself. Abuse no one and no thing, for abuse turns the wise ones to fools and robs the spirit of its vision. When it comes your time to die, be not like those whose hearts are filled with the fear of death, so that when their time comes they weep and pray for a little more time to live their lives over again in a different way. Sing your death song and die like a hero going home. The removal of Native Americans from Pennsylvania was so thorough that by the beginning of the 19th century, they were almost non-existent.